The OC is off on vacation for two weeks. Posting may or may not occur, predominantly as a function of internet access. Will be quasi off the grid so who knows. Thanks to all of my readers and best wishes for a Happy New Year! See you in 2014, if not before. PS: If you subscribe to the page (see the sidebar), you can get notification when a new post comes up. Egypt's military-backed interim government on Wednesday declared the Muslim Brotherhood a terrorist group, criminalizing all its activities, its financing and even membership to the group from which the country's ousted president hails. When will the US government do the same? 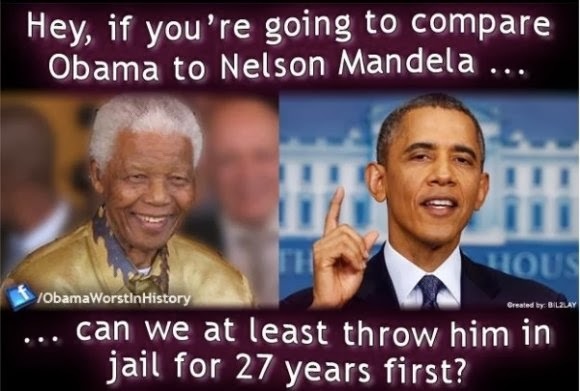 Not as long as The One is still in the White House. His administration has aligned itself with this enemy of freedom, with some Egyptian media reports saying that Obama is an actual member of the Brotherhood. Whether an actual card carrying member or not, he's aligned ideologically. Plus, his inherent hatred of western culture and civilization makes him a natural personal ally of those terrorists. Will history ever understand how the American people got suckered twice into the self-destruction of having this man as President? So...the question is: What does the Egyptian government know that our press and government doesn't? REYKJAVIK, Iceland (AP) — In this land of fire and ice, where the fog-shrouded lava fields offer a spooky landscape in which anything might lurk, stories abound of the “hidden folk” — thousands of elves, making their homes in Iceland’s wilderness. So perhaps it was only a matter of time before 21st-century elves got political representation. Elf advocates have joined forces with environmentalists to urge the Icelandic Road and Coastal Commission and local authorities to abandon a highway project building a direct route from to the tip of the Alftanes peninsula, where the president has a home, to the Reykjavik suburb of Gardabaer. They fear disturbing elf habitat and claim the area is particularly important because it contains an elf church. Just wondering when those folks at the Sierra Club will start invoking something like this into USA court actions. Hmm?? A few days later, Lt. Cmdr. Edwin A. Shuman III, a downed Navy pilot, orchestrated the resistance, knowing he would be the first to face the consequences: a beating in a torture cell. Col. Thorsness tells the story in his moving memoir Surviving Hell: A POW’s Journey. In 2009 NRO excerpted the story from the memoir here. The Times recalls the story today as it notes the death of Commander Shuman earlier this month at the age of 82. RIP. 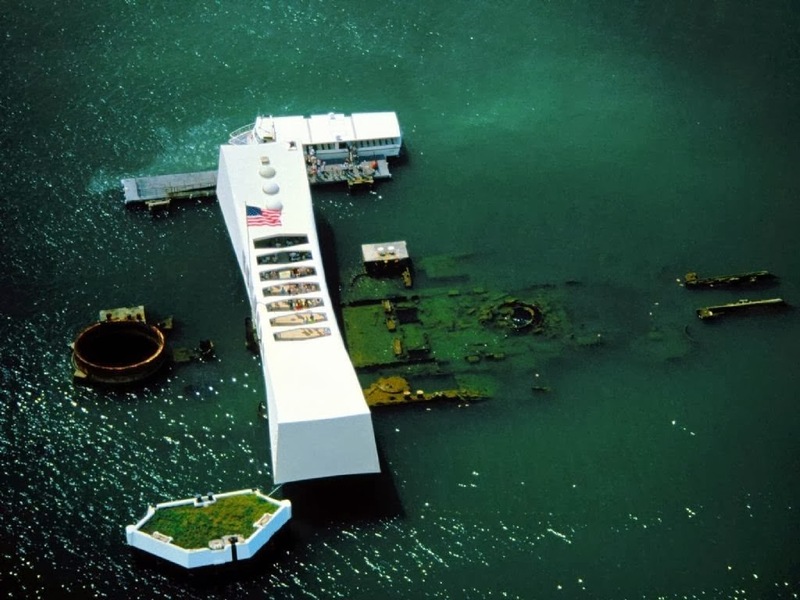 These, and other stories of American character, must never be forgotten. And it is up to us to ensure that such a country never ends. There, I've said it. Now, between the NSA and the Political Correctness Thought Police, I should expect to be on two "naughty" lists for next year. In all seriousness, Merry Christmas. May all your presents fit. Santa - Left or Right? I’ve been making a list and checking it twice, and although I can’t tell you who’s been naughty or nice, I can say that Santa Claus has all the hallmarks of being a conservative. 1. Did you ever hear Santa wishing someone a “Happy Holidays?” No, for the man in red, it’s always “Merry Christmas” – no matter who it offends. 3. Santa’s whole mission is one of private charity. There are no records of the Santa Claus movement being given even $1 in public assistance. Santa epitomizes charity over welfare. 4. He is the sole employer in the area of huge amounts of unskilled elves. Does anyone really believe they are getting minimum wage? They certainly aren’t getting $15 an hour as the unions demand. 5. Speaking of unions, if one calculates the amount of work required at Christmas, there must be some solid all-nighters being pulled by the Santa team. There’s certainly no room for union-allocated breaks and hour limits. Santa’s factory would not meet the approval of the left. 6.Santa is almost single handedly responsible for the surge of consumerism that pounds our culture every year – a trend that benefits big corporations enormously, and something that our liberal friends despise. 7. On the subject of regulation, does the sleigh meet EPA regulations? Its unspecified power source is hardly an approved fuel – yet Santa seems not to care whether it damages the environment or not. Is Santa a global warming ‘denier?’ It sure sounds like it! 8. Santa also operates what would be an enormous factory right near the ice caps. Definitely no climate change concerns here then. 9. Also, flying reindeers must surely be a protected species. Is it ethical to be using them for intense labor lugging around tons of presents across the globe? PETA would surely have a fit, but Santa appears not to have any ethical concerns for Rudolph and his friends. 10. As for the children to whom he delivers gifts, these are no handouts. Kids must earn their gifts via good behavior, promoting a conservative work ethic, and Santa has no problem with snatching gifts away from naughty kids. Punishment is not a naughty word for Claus. 11. The naughty or nice list also shows an objective moral compass. Santa apparently rejects liberal relativism or explaining away bad behavior with pop psychology and ‘culture’ issues. 12. His love of cookies and large stomach shows a blatant disregard for Michelle Obama’s healthy eating program, as it encourages children to believe that eating vast quantities of cookies is perfectly acceptable. If he were a liberal, he’d be asking for broccoli and cranberry juice. 13. Finally, he works with Coca-Cola – one of the biggest corporations on the planet - something that no self-respecting liberal would even dream of doing. The evidence is clear – Santa is a conservative. But our liberal friends should not worry, just like a good conservative, Santa excludes no-one! Merry Christmas! It’s been a while since we checked in Friedrich Hayek (though I did write about him in connection with Obamacare in one of my first Forbes.com columns), but it is worth drawing your attention to a short series of video lectures about Hayek from Tyler Cowen of George Mason University. In addition to writing an occasional column for the business pages of the New York Times, Cowen and his colleague Alex Tabarrok operate one of the more successful online education platforms, Marginal Revolution University. This series walks through each chapter of Hayek’s essay collection Individualism and the Economic Order. They’re all fairly short—about 5 minutes in length—but if you only have time for one, make it this one, about Hayek’s seminal essay, “The Use of Knowledge in Society.” If there’s a single writing by Hayek that everyone should read and know, it’s this one. Unfortunately, the state of economic knowledge in America is horrific. If America is to once again return to its place as the world's economic powerhouse, the American people will have to up their own games in terms of knowledge of markets. And knowledge of how government can destroy those markets. Such as the insurance market. But that's for another posting. According to a new study, alcohol can boost your immune system. Researchers vaccinated animals and then gave them access to alcohol. Researchers found that the animals that had consumed alcohol also had faster responses to the vaccines. According to Medical News Today, the researchers hope this study leads to a better understanding of how the immune system works, and how to improve its ability to respond to vaccines and infections. Researchers were able to show other data to back their findings. According to UCR Today, moderate alcohol consumption has long been associated with a lower mortality rate. Moderate alcohol consumption boosts your immune system while chronic alcohol consumption leads to a suppressed vaccine response. The difference between moderate and chronic is defined by the National Institute on Alcohol Abuse and Alcoholism. They define moderate as no more than four drinks on a single day and no more than 14 in a week for men. For women, it is defined as no more than three drinks on a single day and no more than seven in a week. Neil sums it up nicely. Imagine what an updated version with all of the post-October blunders and fixes would sound like. Some applicants for health insurance in Oregon have begun receiving robocalls from that state's health exchange warning that they will be forced to seek coverage elsewhere if they don't receive confirmation of enrollment by Monday. The Oregonian reports that the robocalls from Cover Oregon consist of a woman's voice saying "If you haven't heard from us by December 23, it is unlikely your application will be processed for January 1 insurance coverage. If you want to be sure you have insurance coverage starting January 1, you have other options." The phone call goes on to say that applicants who don't receive confirmation will be able to get coverage from an insurance company or agent, but will not be eligible for tax credits. So....we make the insurance more expensive, but promise to offset it with tax credits. But then we have a failed system which means you can't avail yourself of the credits. Which means you pay more, and for a policy that fits some bureaucratic standard, not your preference. That's what you get when government tries to get into business. When government knows best. Oregon Gov. John Kitzhaber vowed in November to enroll all Oregonians who needed individual insurance by January 1. In an interview with the Associated Press earlier this month, Kitzhaber said that the process had been slowed due to incomplete applications, some of which had come back unsigned. However, he added "I'm certainly willing to be held accountable for the fact that everybody who wanted coverage by January 1 is not going to get it." So, when are Sebelius and Obama going to be held accountable? Or is it still George Bush's fault? Too often people forget that the idea of tolerance presumes that there is something objectionable that must be tolerated. Toleration is not the same thing as acceptance, yet in the name of the former, many people demand the latter. I'd say that last line hits modern progressives right between the eyes. One of the hallmarks of the "Rule of Law" is that it was a fixed standard. Unlike the days when a king could govern on the basis of a whim, laws established clear and defined standards for the application of governing. But we are moving further and further away from that, back to the "Rule of Men". Or perhaps that should include "Queen Seeb". HOW ABOUT THEM APPLES: OBAMACARE REWRITTEN AGAIN - The federal government banned millions of insurance policies, forbidding what President Obama referred to as “bad apple” coverage. The new policies under ObamaCare were supposed to be, as his chief spokesman said, “an apple that’s fresh and delicious.” If you liked your produce but couldn’t, as promised, keep it, you would like the ObamaCare version even better. As it turns out, many of the people whose insurance policies the administration banned simply cannot afford the new, ObamaCare complaint offerings. What’s answer? To allow Americans to buy bare-bones plans previously available only in special cases. How about them apples? Obama drives another fiat - As ObamaCare’s Web site gets under full steam after nearly three months of failure, it has become clear that the program will result in coverage disruptions for many Americans. Despite the administration calling on the insurance industry to try to accommodate the pandemonium created by contradictory orders from the administration, the latest rule change is essentially waiving a central provision of the law for anyone currently insured. The individual mandate was intended to boost insurance companies that are seeing profits crunched under new federal regulations – margins would go down but volume would go up. It matters to you because without enough paying customers, insurers will be forced to further hike rates. Waiving the mandate is a big change to make by proclamation. Wormy - The worse apples now being pushed by Obama don’t provide much money to offset the risks, and that’s even if insurers are able to keep pace with the ever-changing Obama position on what is good and what is bad for American insurance consumers. The possibility of systemic collapse in the New Year looks increasingly real. This is government on the fly, making it up as it goes. Now, I'm a big fan of improvisational jazz and improv comedy. But not for governing a country of over 300 million people. That requires clear, consistent law. Which is the furthest thing from the minds of those in the current regime. Where are all those folks that complained about the Imperial Presidencies of Nixon, Reagan and Bush? Oh yeah, it's different when it's our guy in the White House. There's been a lot of opinion posted, broadcast and printed over the dispute between Phil Robertson and the A&E Network. So why not add a few more electrons to the mix. First off, this is not about the 1st Amendment. Go back and read the actual text of the Constitution. (FWIW, I've thought that Obama should do the same, but that's for another post. But it did let me get in a swipe at The One.) It's a prohibition on governmental restrictions on free speech. Nothing in it prohibits individual or corporate restrictions. So while the concept of "freedom of speech" is definitely in play, let's leave the 1st Amendment out of this. Which leads to the question, just what is the basis for this confrontation? It's plain and simple. The corporate entity A&E finds that the speech of a contractor, Phil Robertson, is offensive to its corporate sensibilities. As a result, it wishes to alter the terms of the contract between A&E and Phil. That's it. There's no "censorship". There's no trampling of liberties. It's a dispute that deals with the contract over a television show. However.....there's more to it in terms of viewpoints. What is happening is that A&E is saying "we don't want to provide content that features people with a certain viewpoint with which we disagree." And they are perfectly within their rights to do that. Any network can air what it chooses. Logo is a totally gay network, proudly proclaiming it. MSNBC is a progressive mouthpiece. What we now have is that A&E has come out to say that they don't want Christian values on their shows. Fine. Works for me. A&E used to show some great television. Then it lost it's way. Some have speculated that A&E scheduled "Duck Dynasty" as a way for the coastal elites to have folks to chuckle at and to feel superior over. Those rubes in the swamp...they don't eat arugula, they don't read the NY Times, they don't vote "the right way". But it didn't work out that way. Turns out, there are tens of millions of Americans for whom the Robertsons resonate. And they don't like what A&E has done. In other words, to satisfy their progressive social leanings, they have alienated a huge marketplace. The Robertsons have shown that they are savvy businessmen. A&E owns the name "Duck Dynasty". Now the question is....what network will run the sequel show? Anyone for "Duck Empire"? With the Christmas rush and family activities, we took a short break from the blog. But with Phil Robertson, Obamacare and more on the plate, we'll be back later today with more posting. Just as a note, the OC will be taking a vacation break starting December 26th for 2 weeks. And then a longer break for 6 weeks late in January. Like John Beale, we'll be off on a secret mission for the CIA. Unlike Beale, there won't be an EPA paycheck coming in. Flash news. It seems that the African Signing Guy has a new gig. He's been hired to translate Obamacare speeches for The One. Here's his first effort in this new role. H/T to @RyanLGustafson via Ace of Spades HQ. That ornate phrase, more suitable for the Book of Revelations or perhaps the next “Game of Thrones,” installment comes from my colleague Rich Lowry. But I like it. But the third plank in the triad of disinformation hasn’t gotten much attention: ObamaCare will save you, me and the country a lot of money. This lie took several forms. Much more good stuff in the full article, which can be found HERE. 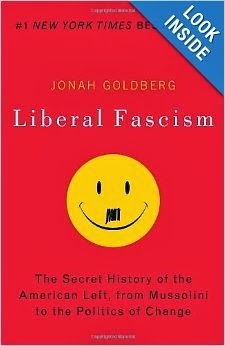 BTW, Goldberg is the author of the splendid book, Liberal Fascism which every thinking Conservative should read. Think you might have actually submitted your information through healthcare.gov to get Obamacare? Think again. Nearly 15,000 enrollment records from Americans trying to sign up for Obamacare never made it to insurers — but the federal government does not know which records never made it to which insurer. The federal analysis merely compares the number of times Obamacare enrollees clicked “enroll” to the number of plans HealthCare.gov sent to insurers, according to The Washington Post. Consumers who send the vanishing enrollments, or “orphan files,” are not notified that their information has not been processed and an insurer did not receive sensitive financial and health-related data, meaning that they could be in for an unpleasant surprise when the Dec. 23 deadline — the last day for customers to sign up for health insurance — comes and goes. Yep...working just great. And you know the sad part? 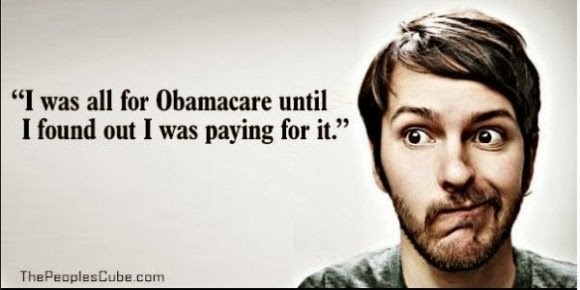 Most of those who get "bit" by this latest website error will probably be Obama supporters who'll blame the insurance companies. Not those geniuses at HHS, led by Queen Seeb. 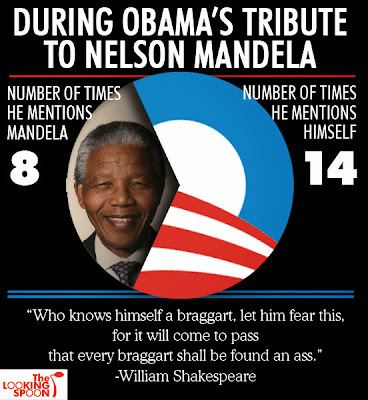 H/T to The Daily Caller. Amazing how the whole world revolves around The One. It's all about his image, his persona, his cult of personality. H/T to Patterico for the image. Is Santa on the Right? Santa has a job, and he does it in a remarkably efficient manner. He performs a valuable service, delivering presents all across the world in a single night, while facing logistical nightmares that would terrify the average liberal. Here are some other indications that Santa is definitely a conservative. He makes a list and checks it twice. Lefties wouldn’t bother re-checking the list, if they could bother to make it at all. 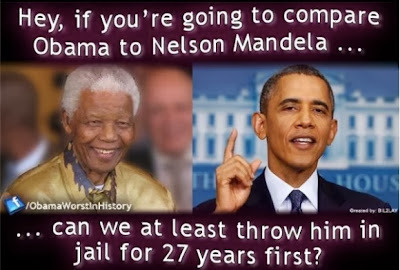 Obama would delegate the list-making to Valerie Jarrett and go play a round of golf. He cares if you’ve been bad or good. If you’ve been good, you get your presents. If you’ve been bad, you get a lump of coal. He believes in personal responsibility and consequences for bad behavior. 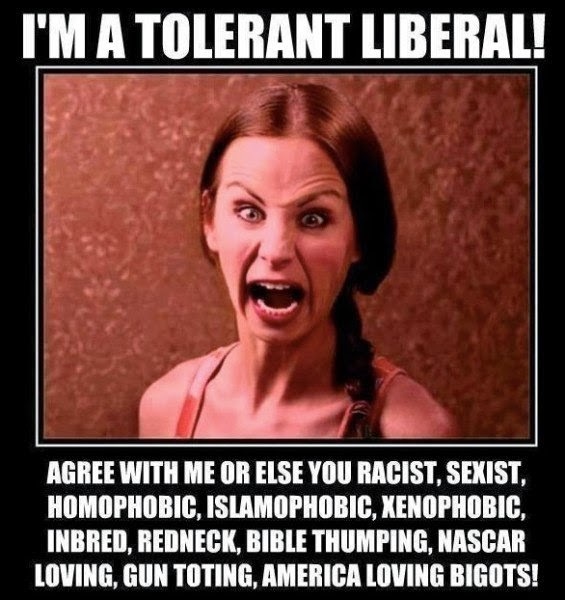 What part about any of this sounds leftish to you? He has a large workforce, albeit of elves, and knows what it means to make a payroll. You think elves work for free? And I’m told they’re not always that easy to work with. Managing problems like this tends to make one conservative. I do have to acknowledge two counterarguments. He does take credit for others’ good deeds, which is kind of lefty behavior. And he seems to be quite a fan of the surveillance state — he sees you when you’re sleeping? He knows if you’re awake? Really? — which is a disturbing characteristic that crosses ideological lines, as Bush and Obama both went overboard in that area. Listen, I’m not saying the guy’s perfect. But look: Reagan signed an amnesty bill. On balance, Santa is pretty danged conservative. Gotta agree.....though The One is trying to take his place, at least in the giving of gifts department. Or should we say giving to his favored supporters by taking from the rest of us. What's $300 million divided by 44? That's the math question of the day, for those into cost/benefit analysis on Obamacare. And for the rest of us as well. The Oregon health insurance exchange signed up only 44 people through the end of November, according to a report by the Department of Health and Human Services. Oregon was unable to reach triple figures despite receiving nine figures in federal money to build and promote its exchange. The amount of federal aid exceeded $300 million. As Philip Klein notes, Obamacare fans can’t blame Republican resistance for the program’s failure in Oregon. The state is run by Democrats and it embraced Obamacare from the start. Indeed, its outreach program has been praised by Obamacare supporters, according to Klein. For those who don't have a pencil handy, that works out to over $6,800,000 per signup. And we don't even know how many of those actually went through the whole process to get functioning insurance with payment. And for anyone thinking, we'll that's Oregon's problem - remember that "federal aid" is just code for "USA taxpayer money". As in you and me. Personally, I think most of the 44 would have just rather gotten the money and worried about paying medical bills from it. You know....that might even be the rational economic thing to do. Anyone have a phone number in Salem, Oregon to call the governor with an idea? Mitch Berg of the Twin Cities writes a blog entitled Shot in the Dark. He posted this today and it deserves reprinting in full. …and the many, perhaps dozens, of people whom Roberts couldn’t murder in the ensuing minutes and hours, because Nick Meli – a citizen with a carry permit and a .40 cal Glock 22 – made Roberts stop short, and then end his shooting spree by killing himself. (We talked about it yesterday). If you see Representative Heather Martens, Jane Kay, their PR flak Doug Grow, Michael Paymar, Alice Hausman or any of the Twin Cities’ other gun grabbers, please do me a favor and remind them – Nick Meli saved more lives in that moment than they and their groups of smug, sanctimonious, sputtering hamsters ever will. Mitch also does a weekend radio show, available online. Good stuff all around. AccessHealthCT, the quasi-public state agency that runs Connecticut’s Obamacare exchange, spent nearly $75,000 to commission three murals, plus nearly $4,000 to have one of them installed. Contracts with the three artists – Adam Niklewicz, Katro Storm, and Rafael Cornier Jr. – show they were each paid $24,980 to produce murals 8 feet tall and 32 feet long. The agency paid AdamsAhern Sign Solutions $3,945.51 to install the Niklewicz mural at the Hispanic Health Council in Hartford. Silly me. Who would have known that reform means buying art as a "creative way for us to express that committment". Guess that makes me one of those Neanderthals I keep hearing liberals refer to. H/T to NRO's The Corner, where you can see a photo of one of the "murals". Personally, I think it's barely worth $25 let alone almost $25,000. Oops....can't use that word "boy". Might be racist. Anyhow, we're talking about Charlie Rangel here. Yep, Mr. Clean. As you may or may not remember, Charlie was censured by the House of Representatives and stripped of his chairmanship. So, what did he do? Yep, just like any self-respecting liberal, he sued. However, it didn't turn out as he hoped. A civil lawsuit against members of the House and Congressional staff filed by Rep. Charles Rangel (D-NY) was dismissed by the U.S. District Court of Columbia on Wednesday. Rangel sued House Speaker John Boehner and other House members in April over his 2010 censure in the House of Representatives. In the end, everything on Rangel’s wish list implicates insurmountable separation-of-powers barriers to the Court’s exercise of authority. This Court is a court of limited jurisdiction under Article III, and Rangel has not properly asserted any claim within the bounds of that jurisdiction. The House has wide discretion to discipline its Members under the Discipline Clause, and this Court may not lightly intrude upon that discretion. Moreover, Members of Congress (along with their aides) are entitled to broad—although not unlimited—immunity under the Speech or Debate Clause. And perhaps most problematic is Rangel’s unprecedented view that this Court may order the House to, in effect, un-censure him. Rangel’s quarrel is with the House, and it must stay there; he may not under these circumstances enlist the Court’s involvement in that quarrel. Damn. Some common sense from a federal judge. Must not have been an Obama appointee. For those who may want some history, Rangel succeeded Adam Clayton Powell Jr. for his congressional seat. And old Adam had ethics and corruption issues as well. Maybe there's something in the water there in Harlem. 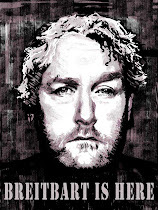 H/T to Big Government at Breitbart. Ever have a relative at the Thanksgiving dinner that doesn't know when it's time to leave? That sticks around forever. Well, a legislative version of The Man Who Came to Dinner is rearing its head now. With time running out to reauthorize a 5-year Farm Bill, sources on Capitol Hill tell Breitbart News that Congressional leaders are preparing a short-term, one-month extension to allow more time for negotiations. Congress is desperate not to let the Farm Bill expire on December 31st. If it does, a decades old law would be triggered, causing the price of a gallon of milk to spike to $8 or more a gallon. If the Farm Bill expires, farm programs revert to permanent law, passed in 1949. That law would require the federal government to buy milk and dairy products from producers at around twice the market rate. The government would also be required to maintain that price level through additional buying. It is estimated it would cost the government $12 billion a year to support the higher milk price level. Did that say 1949? Yep. Rather than have to deal with a "farm bill", why doesn't someone in Congress with some common sense just put a stake through the heart of that old legislation and get it off the books, once and for all? But no - it's all a political game, tying the price of milk to other desired outcomes in one large complex bill. Personally, I'd be happy if milk prices went to $8 a gallon. If nothing else, it could show the folly of having our federal government in the business of business. Xadrian McCracken may be the poster child of the dysfunction of Illinois government. Fired last year from a state job, McCracken took a senior position in July with the Illinois Department of Corrections, earning $110,000 a year. He secured the position advising on parole policy in spite of a criminal history with "at least" 24 criminal arrests. McCracken's criminal history includes arrests for arson, illegal gun possession, attempted robbery, drug possession and aggravated assault. He plead guilty to a weapons charge in 1989 and was found guilty in 1999 for a charge related to domestic battery assault. He has worked for IL state government since 2000. Prior to that, McCracken had sought to become a Chicago police officer. His application was rejected after a criminal background check. McCracken sued the department, arguing that the background check was racial discrimination. U.S. Magistrate Judge Arlander Keys threw out McCracken's suit, noting in his ruling that the police background investigation found McCracken to be a known “drug dealer, gang member and supplier of guns to other gang members." Keys' ruling was in August 2000, the same year McCracken went to work as a child protection worker with the state's Department of Children and Family Services. He has been in and out of state government since then. Just remember....that's YOUR tax money funding his employment. And given the lousy state of Illinois finances, you can be sure that federal funds will be there to prop up the corrupt Democratic government. Word to the wise -- whenever you hear the words "federal funds", that means it's coming from your taxes. Not some mystical pot of money found in the forest. And there's no Rumpelstiltskin to spin gold from straw. But hey...you gotta admit McCracken's got a nice gig at the taxpayer's expense. 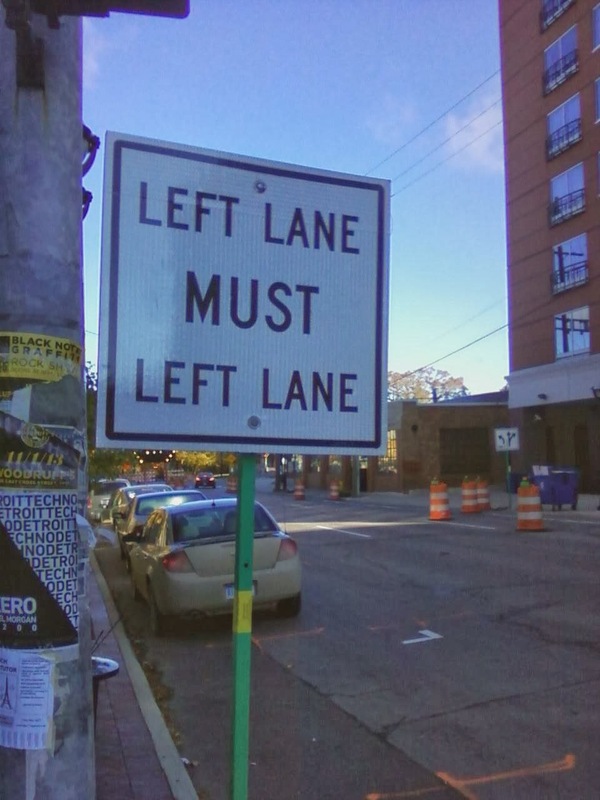 After all, that's the Chicago Way. Well, the Obamacare letter came in from my insurance company today. And thanks to the diligent work of Mrs OC, all is well. We basically self-insure ourselves for regular medical care and carry a high-deductible "catastrophic" plan for the big stuff. Which luckily hasn't been necessary. Nor do I hope it to be. It's a $10,000 deductible, which is enough to put a dent into our finances but not so bad as to bankrupt us. It's insurance the way the word should be used. Not as it has been corrupted in regards to "healthcare". You see....the whole thing is an example of our bastardized language on this issue. For it's not about "insurance", nor about "healthcare". It's about "payment". Who's going to pay for it? Under what conditions? No one in America is denied "healthcare". The care is there, available in the free market. If I want, I can get care from the most expensive doctor in New York City. No one is stopping me by regulation or law. But there is the factor of the free market in action. Think of it like the criminal legal system. If you are destitute, it's not like you can't get legal representation. The courts have ruled that you are entitled to counsel in all criminal maters. But that doesn't mean you get a Racehorse Haynes or an F. Lee Bailey. Same with medical care. You see, it all comes down to paying for it. Who pays for it. How much will they pay for. Not whether you can get it, but who pays the bill. Me and Mrs OC have said we're willing to pay for the day in, day out care and have "insurance" for the disasters. Just like our car insurance and homeowners insurance. My car insurance doesn't pay for an oil change. Or tire rotation. Or a tune-up (or whatever it is nowdays with all the fancy electronic ignition and fuel injection). It pays when I'm in an accident and the damage is in the thousands. Same with insurance on my house. I pay to have it painted. I pay to have it heated. But if a tree falls on the roof, or there's a fire -- that's when "insurance" comes into play. So, when you hear all the wailing about "healthcare", think of it in terms of your car or house. And how the debate language has been hijacked. It's not about "healthcare", it's about the money. And the control. Because those are the things government loves to get its fingers into. As for the OC household....luckily we have a policy that is grandfathered, and an insurance company that isn't playing the game of changing deductibles or co-pays or anything. So we get to keep our "insurance". Maybe our company saw how screwed up Obamacare is and decided to insulate itself by making some plans stay the same. I hope so. And I hope that decision maker stays at his job til Obamacare dies. And may there be a DNR order firmly on view at the bedside. Tomorrow we may go to multiple choice. The problem with this kind of humor is that it comes very close to the truth about Obama's public statements. 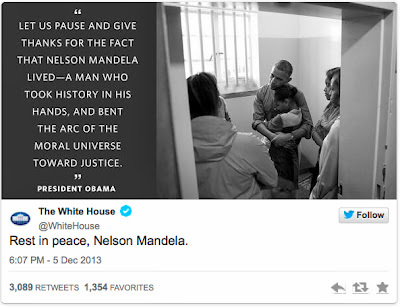 (Sidebar thought -- it's tough to use the words "truth" and "Obama's public statements" in the same sentence). Yesterday it was your health plan. Or your doctor. Which of these will be the next thing that Obama will seek to control and destroy. In a hundred years, history may just record how mass hysteria/hypnosis caused America to select such an enemy to be our own elected leader. That is, if this Republic lasts that long. Volunteer fire departments all across the U.S. could find themselves out of money and unable to operate unless Congress or the Obama Administration exempts them from the Affordable Care Act. "I thought the kinks were worked out of Obamacare at the first of the month, Central Florida volunteer firefighter Carl Fabrizi told Sunshine State News. The U.S. Department of Labor takes the term 'volunteer' literally, but the IRS says volunteer firefighters are technically employees if they're on the job more than 30 hours per week, making them subject to Obamacare's employee-mandate rules. Since the Obamacare law doesn't specifically carve out an exemption for them, fire departments where 50 or more people work – either as volunteers or real employees – are expected to provide health insurance for every one of them. In towns with more than one volunteer fire department, all the staffers will likely be lumped together for tax purposes, pushing many above the 50-worker threshold. That could cost department of life-savers hundreds of thousands of dollars each year. Those that dump their volunteers into the federal insurance exchanges would still have to pay an annual $2,000 fine for each 'employee' after the first 30. There are so many hidden traps in the ACA, craftily inserted by staffers, lobbyists and political hacks. The only real question is -- will Americans become so fed up with the lies, distortions and bait & switch that they end up voting against Santa Claus? November 2014 and 2016 will be interesting times. This one brought a smile to my face. Couldn't happen to a nicer guy. Controversial House Democrat Alan Grayson lost $18 million as part of a criminal scheme run by a Virginia man that bilked more than 100 investors out of more than $35 million, according to federal court documents. William Dean Chapman, 44, of Sterling, Va.,was sentenced to 12 years in federal prison on Friday. Chapman pled guilty to one count of wire fraud in May, according to the U.S. Attorney’s office for the Eastern District of Virginia, which oversaw the case. Chapman was the founder and owner of Alexander Capital Markets. Customers would give their stock holdings to Chapman as collateral for loans. Chapman then improperly sold the stocks, despite assuring the customers that they would get back the full value of their holdings. The full story is at Politico. 'Nuff said. Matthews and Morgan. Unhinged and ungrounded in reality. Stolen from various spots on the Interwebs, a combination of graphic humor and commentary. The Treasury Department on Monday announced that the government has sold its remaining shares of General Motors and that losses from the 2009 auto industry bailout total about $15 billion. It's just $15 BILLION dollars. Nothing to see....move along now. Plus, don't forget how the UAW got their claws into the company's equity. How bondholders were stiffed by flagrantly illegal disregard of bankruptcy law all to reward the union cronies of Obama. Exactly how did they put it....oh, yes. "Bin Laden is dead, GM is alive". But Detroit is in bankruptcy. Watch for Obama to try to send a federal bailout in that direction too. Government Motors. The forerunner of Government Medicine. All coming from those enlightened folks who know what's best for you. HARRIS-PERRY: “I want to talk today about a controversial word. It’s a word that has been with us for years. And like it or not, it’s indelibly printed in the pages of American history. A word that was originally intended as a derogatory term, meant to shame and divide and demean. The word was conceived of by a group of wealthy white men who needed a way to put themselves above and apart from a black man, to render him inferior and unequal and diminish his accomplishments. “Y’all know the word that I’m talking about. 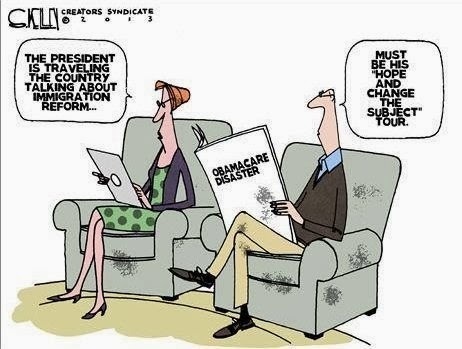 Obamacare! That’s right! I said it and I’m not ashamed, and neither is President Obama!" The unhinged rantings are amazing. Yet the left believes this is what passes for normal thinking. H/T to Weasel Zippers for the pointer. The narcissism grows and grows. The One keeps reading this own reviews. Thanks to The Looking Spoon, and a H/T to Freedom Is Just Another Word. An excellent post on the latest deception from the White House. This is a new made-up TOTUS phrase, a rhetorical squirrel, used to attempt to imbue their flawed and failing product with the characteristics of one they wish they had. 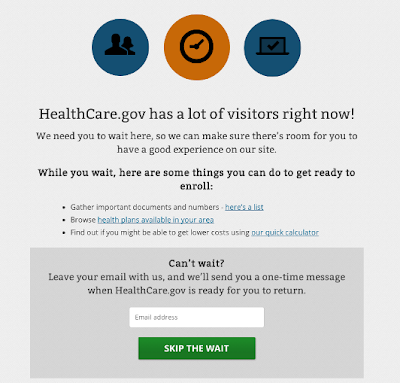 In the instant circumstance, Obama touted healthcare.gov to be like Travelocity. Let’s see how they stack up. If people logged onto Travelocity and after a couple days were able to create an account — after filling out a paper application, and after calling a 1-900 number, then they are very similar. After hours/weeks/months you then get to go shopping. If Travelocity only showed some of the available hotel rooms, and only to some of the account holders, it wouldn’t last long. If 30% of the people who booked a hotel room on Travelocity arrived at their destination and the hotel had no record of the reservation, their business model would collapse. If Travelocity didn’t bother to create payment and subsidy systems, and allowed the hotels to calculate estimated payments from the government, and had no mechanism at all to take payments for hotel rooms, they would go out of business with private sector velocity. If Travelocity compelled people to reveal all of their pertinent information, and then created a website that was an abject security nightmare and failure, Travelocity would have multiple class action suits filed with private sector velocity. Fortunately, the Feds in ObamaCare have no legal obligation to inform you that they failed to even try to secure your personal info. Private sector velocity is a SQUIRREL lie they are trying to sell. Does Travelocity have a tortious interference claim against Teh One? Stolen in its entirety from Patterico's Pontifications. An excellent blog, worth visiting directly. You can also find it in the sidebar blogroll. I wanted the images of the Arizona to be the only message for December 7th. 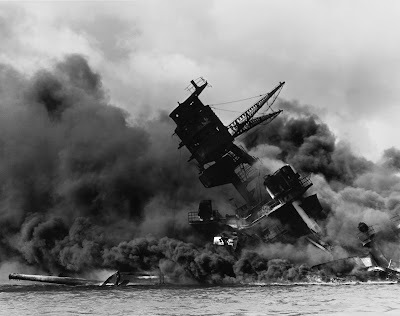 A date which will live in infamy. Now that it's the 8th, time for some more posts. 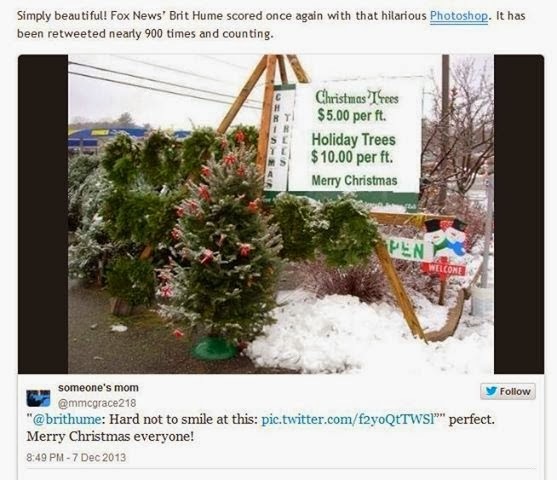 First, a light hearted take on "Merry Christmas" versus "Happy Holidays". Or at least the arboreal version. Stolen from The Lonely Libertarian. These two photos say it all. Let us never forget. May the Arizona remain a symbol from which we can learn. Photos from The Feral Irishman and Knuckledraggin My Life Away. created by left-wing economic policies..."
There are a number of theories and explanations for the decline of the city of Detroit. From being the city with the highest per-capita income to the largest municipal bankruptcy is a steep and tragic decline. However, here at the OC, we have photographic evidence of what's made Detroit the city is is today. Stolen from It Aint Holy Water. Bill Whittle, talking about his recent holiday trip. It starts off with "Well, I was in Texas for Thanksgiving this year. I flew in from Los Angeles and it's always such a pleasure to visit the United States of America. I was raised there as a boy myself." Plain talk, straight and to the heart. Wish I would have a chance to have a couple beers with the fellow some day. H/T to The Daley Gator. H/T to Freedom is Just Another Word. A mentally disturbed man is wandering through traffic outside New York’s Port Authority Bus Terminal. Naturally, the NYPD open fire. They miss the guy. However, the sidewalks being full of people, they manage to hit two female pedestrians, one of them already using a walker, which comes in handy when the coppers shoot you in the leg. “The defendant is the one that created the situation that injured innocent bystanders,” said an assistant district attorney, Shannon Lucey. Ah, yes: the “situation” injured the innocent bystanders. If you outlaw guns, only situations will have guns. The defendant is looking at 25 years in jail for the crime of provoking law enforcement into shooting random citizens. If this flies in New York, then there is no law. This is just the latest in the even growing trend whereby just about anything you do can be construed as a crime. The rush to criminalize ordinary behavior is one more example of the ever-expanding reach of The State to control and punish the citizenry. Somehow the OC managed to miss a historic anniversary yesterday. Nope, not the one with Mrs. OC. It was something even more significant. 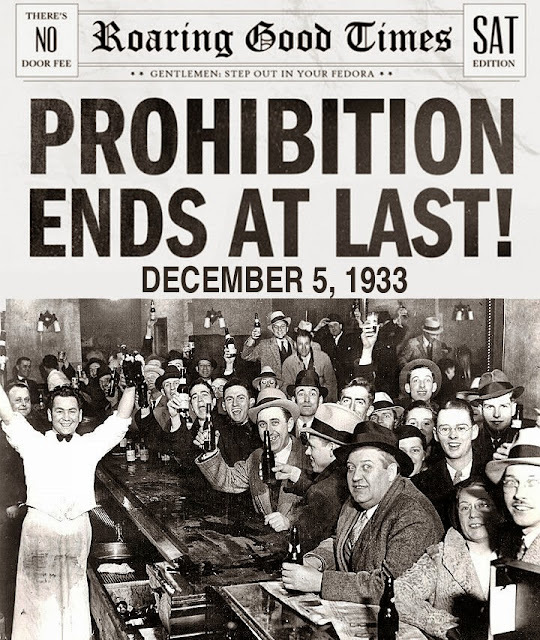 December 5, 2013 was the 80th anniversary of the effective date of the 21st Amendment to the US Constitution. Which, for the non-constitutional scholars in the audience, repealed the 18th Amendment. 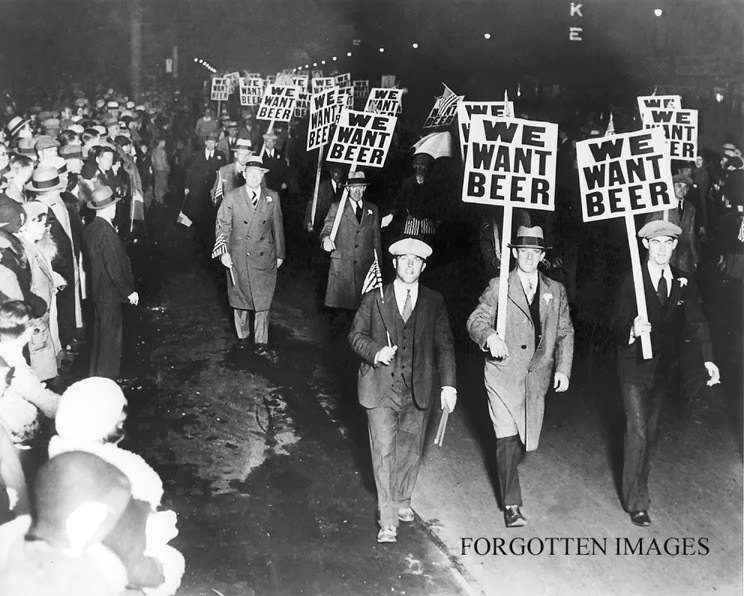 Which established Prohibition. Prohibition created many things, but they didn't include clean living for all Americans. It created organized crime on a scale never before seen. It created a nation of scofflaws. It created a culture of corruption. Sorta like an early version of the Obama administration. In any case, here are two photos stolen from Powerline. Myself - it will be a "wee dram" of a fine whiskey tonight to belatedly toast the eventual wisdom of the American people. 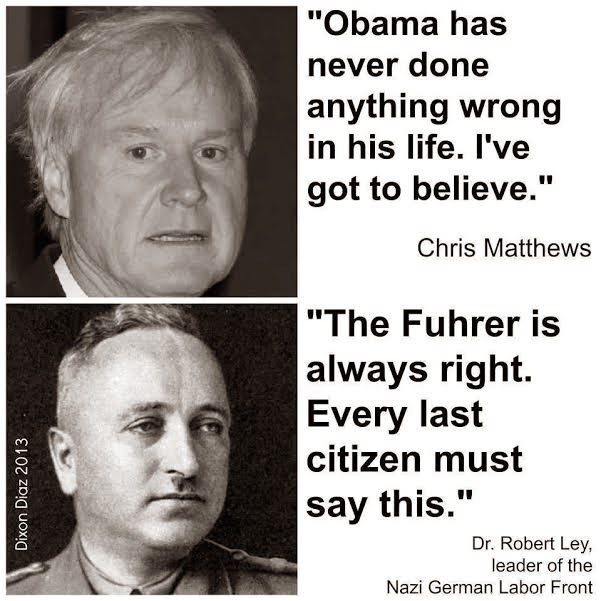 Maybe today's America will wake up just like they did in 1933. Seems that the OC is a bit behind the times. This is at least the second time this week that The One has interposed himself into the public memory of a noted figure. Must be something to be so wonderful - and to know it's all about yourself. Nelson Mandela died today. Grand talk about his impact on South Africa and the world. All true. But don't forget the associations with the Communist Party. Don't forget about the terror tactics used by his African National Congress. Finally, getting to our headline. How else would a narcissist note the passing of a world-renowned leader? Yep, by posting a picture of himself. Stolen from Knowledge is Power. Harry Reid once again shows his stripes. There is the law for you and me, but a separate one for the privileged and elite. Washington (CNN) -- Democratic Senate Majority Leader Harry Reid, one of Obamacare's architects and staunchest supporters, is also the only top congressional leader to exempt some of his staff from having to buy insurance through the law's new exchanges. You see, they are our betters. They know what we need for our lives. 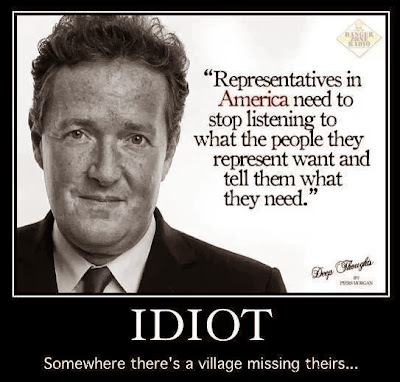 And they also know that isn't what they want for themselves. Remember that whenever you see such hypocrisy and elitism. News is out on the future plans of Barack Obama. No, we aren't talking about what to do with Obamacare. Or Syria. Or Iran. Or Russia. And not about North Korea, unemployment, stagnant wages, tepid economic results or national defense. It turns out that Obama wants to transition from the most powerful man in the world, (though some say that's now Vladimir Putin), to host of SportsCenter. If you have any doubt as to how much of a sports junkie Barack Obama is, check in with the entertainment moguls who attended a private briefing with the president Nov. 26 before his speech at Jeffrey Katzenberg's DreamWorks Animation campus in Glendale. That day can't come soon enough. Even the prospect of President Biden doesn't faze me. Well....hell froze over today, but only in one small spot of the liberal universe. Martin Bashir, of MSNBC ilk, has resigned. About time, but unfortunately, it's not enough given the liberal pantheon of hate. Bashir had already apologized for what he called "offensive" comments about the former Alaska governor, whom he also called an "idiot" and "dunce." He told viewers in a scripted commentary last month that someone should defecate in Palin's mouth. He was invoking an old slave punishment in response to a speech by Palin, a Fox News contributor, comparing the national debt to slavery. You see....it's ok for liberals to slam conservatives. How many times was there the "Bushitler" reference? The calls for Cheney to die of a heart attack? The slurs and insulting characterizations of Palin? But that all acceptable. These are the right people, attacking those evil Republicans. They are on the side of compassion and understanding. Except for when they are the ones casting the hate. Bashir took off two weeks for what was billed as a vacation, and criticism mounted as MSNBC took no disciplinary action against him, even as it booted Alec Baldwin over an alleged anti-gay slur hurled at a photographer. In retrospect, it's clear that by failing to suspend Bashir, MSNBC allowed public pressure to build to the point where the only way to control the damage was to sever its relationship with the British journalist. Baldwin was an easy one to toss under the bus. He had violated the rule of speaking ill of one of the Democrat's protected classes. And he wasn't really a "journalist". But by skating on Bashir, the hypocrisy over the double standard was too easy to juxtapose. Attack gays -- get canned. Attack Palin -- well, take a vacation. Further, look what it took to get MSNBC to take action. It wasn't the "idiot" or "dunce". It was only when Bashir got scatalogical did he cross the MSNBC "line". Shouldn't that line be much closer to the center? So, MSNBC cleans its gene pool a bit. The only question is whether they will now take a stand when the race-baiting Al Sharpton crosses the line. Along with the others on their payroll. My bet is that the word has gone out -- keep up the slanderous attacks, but stop short of human waste. Which is kind of ironic since much of the output at MSNBC is just that. As you might have heard, the NFL has banned a gun manufacturer from advertising during the Super Bowl. Interestingly, there is never a weapon shown during the commercial, and just a silhouette drawing in the logo at the end. But that was still too much for those PC folks at NFL Central Command. Colion Noir has compiled a video of the banned commercial, plus a few of his comments. This is too good to exerpt, so here it is in its entirety. Reprinted without permission, but most assuredly with appreciation. And thanks. The great George Will nails this one out of the park. We are tomorrow’s past, so this Thanksgiving give thanks for 2013, a year the future might study more for amusement than for edification. HealthCare.gov performed the public service of defeating Barack Obama’s ascription of every disagreeable effect to one of two causes — George W. Bush or global warming. Concerning the latter, a CNN anchor wondered if an asteroid that passed by Earth on Feb. 15 was “an effect of, perhaps, global warming.” The Los Angeles Times announced that it had stopped publishing letters questioning global warming caused by human activity. This video is a couple of months old, but it exemplifies the mindless Obamatron youth. Gotta play it a couple times to catch all the digs. There's a new NRSC video out. I'm not a big fan of the NRSC because of their often RINO-esque behavior and the squish of many GOP senators. But, if it's a choice of a Senate run by Harry Reid or one run by Mitch McConnell, I know which is my choice. So, let's get the Senate majority first, then worry about the extent of their conservative credentials. BTW, it's pretty good. Those video clips should run again and again and again, just to remind the voters how the Democrats all lined up to ram Obamacare down our throats. H/T to The Lonely Conservative. Hillary Clinton is set to receive an award on Tuesday evening from the Elizabeth Glaser Pediatric AIDS Foundation (EGPAF) for her “legacy of leadership” in combating HIV/AIDS. That may bit a bit awkward, given that, as secretary of state, Clinton riled AIDS activists by slashing the State Department’s programs for AIDS prevention and treatment. Not as much a travesty as the hypocrisy that liberal gay activists display. George Bush does more to fight AIDS than any other president, but they line up like lapdogs to support frauds like Obama. How can they look themselves in the mirror? People have been saying that the lies told by Obama would be criminal fraud if done by someone in the private sector. Buf for our anointed one, it's just standard procedure. While the Obama administration looks to put HealthCare.gov’s woes behind it, another one of the health-care law’s key aspects could pose the latest problem for its supporters. A report by the Treasury Department’s inspector general found that the law’s health-care subsidies may be susceptible to fraud. According to the report, problems will likely arise as recipients claim the subsidies on their 2014 tax returns. To address this issue, the IRS must improve its current system and controls for preventing fraud. Yep....those wonderful folks at the IRS, who will impose the "tax" for the mandate, now have one more thing to deal with. Simply marvelous, as we used to say.